Who would have thought that fall of this year would mark the 40th anniversary of when 7-11 first purchase 3 of John E. Mitchell's frozen drink machines. (The original idea came from an Omar Knedlik who started serving ice-cold bottled drinks when his soft drink dispenser broke down.) By 1967, there was a Slurpee machine in ever 7-11 and the two became synonymous. In 1972, collectors cups for the drink were introduced. There have been over 200 different flavors of the Slurpee, more than 13 million of the drinks are consumed every year (over 6 billion sold since 1965) in the last 40 years. Sure, contenders would come and go. I used to live near a Stop-N-Go during the late 70's which would have what was called a Chilly Willy (had more liquid than a Slurpee.) 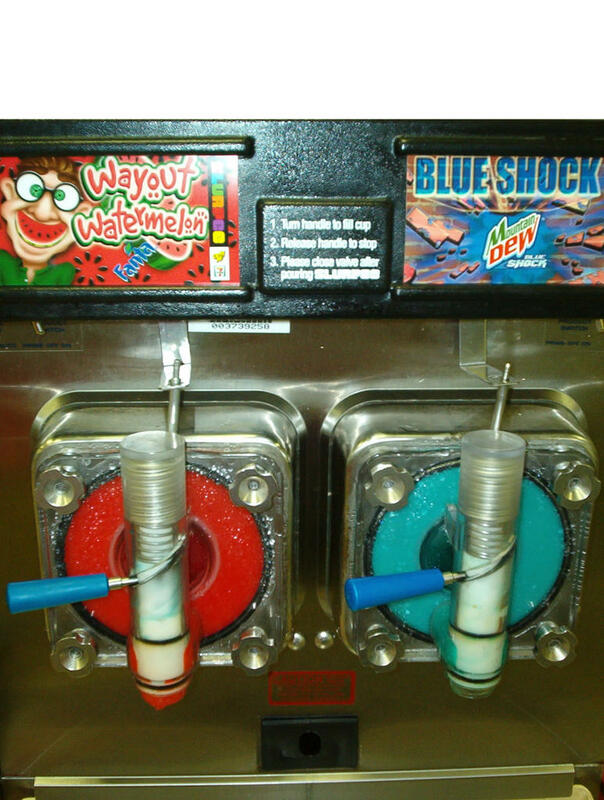 There was even the Icee and the Slushee. But the competition has never really met the challenge. What I find most interesting is that there is a difference between the U.S. and the Canadian Slurpee. Winnipeg, Manitoba, Canada (with a population of under 700,000) consumes the most Slurpees worldwide. The Canadian mixture has less air bubbles which makes it more dense. I absolutely love Slurpees. I haven't had one in quite a while, though. I think it's interesting that buying habits and product design very so widely with location. I mean, here in Massachusetts products and designs are different than what I was used to in California. Coke's my favorite. I'm a simple girl with simple needs. Slurpeeeeeees are so good. They have those sugar free ones now too, which is great. Slurpees are an important part of my life. Whenever Josh is feeling a little down we take a trip to the Sev and talk over slurpees. Who knows maybe this will be a tradition he passes on to his kids? Slurpees, ice cream, smoothies...Teri likes them all she is equal opportunity. Too bad I despise going into gas stations. I'll have to spend $50 for a medium Slurpee at the theater. I can't wait! You always make me crave stuff, Martin. Stop it! Salvation, thy name is Hawaiian Punch Slurpee!